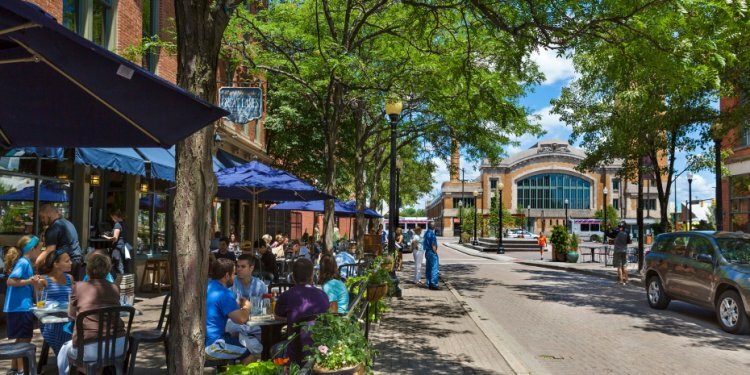 Cleveland's choice for high-octane retail therapy, Crocker Park is an all-day destination for strolling, dining, and — oh yeah — whipping out that Kate Spade wallet. Broad sidewalks, ample parking, and gorgeous seasonal landscaping give easy access to shops like Anthropologie and Urban Outfitters. There are also plentiful pit stops like 87 West Wine Bar, along with Trader Joe's, a Regal Cinema, frequent family activities, and a weekly warm-weather farmers market. Come to think of it, why would we ever leave? Consider yourself a fashionista? Then this tony Beachwood mecca is your kind of place, filled with thousands of square feet of your favorite boutiques and department stores, including area exclusives like Saks Fifth Avenue and Nordstrom. It's the East Side shopping destination that pulls guests from all corners of the region. Stuffed with indie-rock records — from the latest CDs to the newest vinyl — this cool little record shop next to the Beachland Ballroom in North Collinwood's Waterloo neighborhood continues to be a hipster fave. Besides the multitudinous recordings, the spot also hosts occasional in-store performances — the better to get up close and personal with your guitar-strumming heroes. Like a Magical Kingdom for treasure hunters, the Ohio City outpost of this 15-store chain offers astonishing bargains on gently used clothing, furniture, electronics, and accessories. And should you ever be in need of a Halloween costume, remember: They don't call this place "unique" for nothing. Unique's Half-Price Mondays feel like a bountiful garage sale run with military precision.